Just got back from sending the last email. Found 2 local policemen who stopped by for tea. I think I’ve become an object of curiosity among the constabulary up and down the coast. Picked up a bunch of great looking pineapples from a roadside truck on the way back for USD 90 cents each. The chief monk’s bedroom has a small TV. It’s crowded with monks and villagers watching the Independence Day military parade broadcast from the Galle Place parade grounds in Colombo. My bathroom has the only flush toilet in the building. I am very respectful of it and polish it every day. I also leave a few coins in a saucer on top of it and light joss sticks daily. This is my way of asking it not to become angry with me. Nothing’s going on in the village this morning. If I didn’t have to make some changes to my Windows XP lesson materials, I’d put a mat out on the front veranda and snooze for awhile. Today’s not too hot and there’s a small breeze blowing up from the ocean. … Sorry, just got called in to watch the SL Air Force MIG 247s fly over the parade. Also caught a women’s unit of the Army marching by with their automatic rifles. They looked fierce even in their uniform skirts. I’m back. The politicos have started their speech making now. A friend of Sandra’s whose husband works at Microsoft got 6 copies of Windows Vista and Office 2007 for the project at their employee discount. It was much cheaper than for me to buy XP and Office 2003 on eBay. I have been worried about this because I think these may be the only 6 copies in all of Sri Lanka. Windows 98 or earlier and Office 1976 or thereabouts are the prevalent software. As it turns out the refurbished PCs have Windows XP SP3 already installed. I’m still trying to decide whether to upgrade to Vista or not. Champi and Madushi are somewhat familiar with XP already, the PCs and network are very stable, and Office 2007 is running very well on XP. I think I’ll wait until the classes are over but long enough before I leave to know that everything is stable. Although I may be forced to do it earlier. I can’t get the Sinhala keyboard installation kit to work in XP. OK, forget snoozing. The loudspeaker has just begun to announce a special service today. The volume is loud enough to be heard throughout the entire village. Just finished lunch. Red country rice, curried cabbage and potato, curried gourd, curried green banana, and curried something else. Seriously, it was very delicious. An older man who befriended me during my last visit brought it for today’s dane (meal offering) for the monks and me. He stood by my side and made sure I tried everything, which I was glad to do. If I get up from the table quick enough, I can scrape my own plates into the dog’s bucket and carry them to the wash sink. I’m uncomfortable with being tended and catered to, especially from people who have more than enough work to do just to get through life. 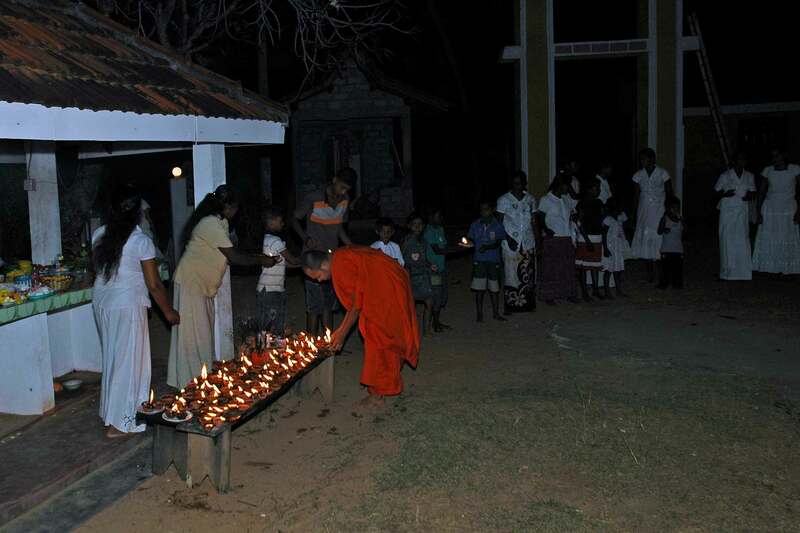 A senior monk from Colombo has been invited on this holiday occasion to give a sermon. Of course, I can’t understand what he is saying but his voice and the rhythm of his delivery are very beautiful. Apparently he has some fame because it looks like people from neighboring villages have also turned out. Like any church service, the women are up front, the men are hanging around the edges and mothers are up and down quieting restless children. 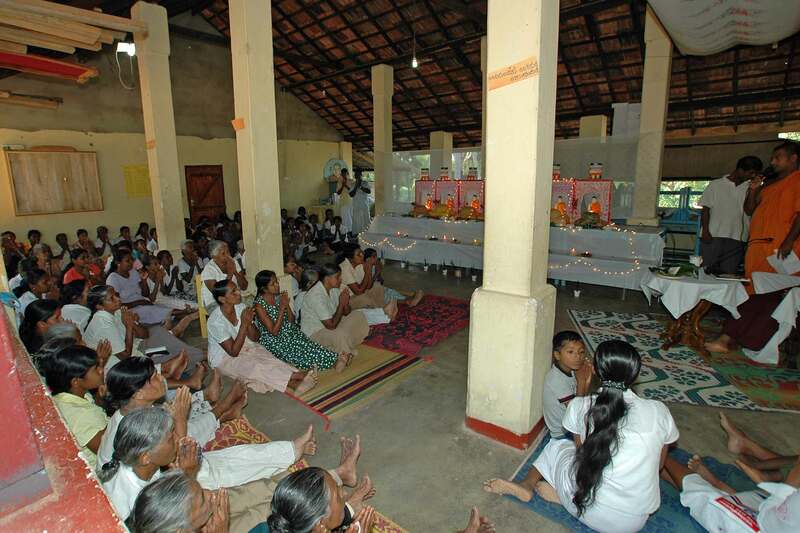 In this case, however, the separation of sexes is because it’s customary for the women to set separate from the men and as it happens they overflow the dhammasala (preaching hall) and the men have to find what shade they can outside. Boys and girls sometimes set side by side in my classes but when monks are participating, they and the boys set on one side and the girls on the other. During the preaching, some of the ladies are preparing a large tub of coriander tea for the gathering which is thought to be good for clearing the mind. 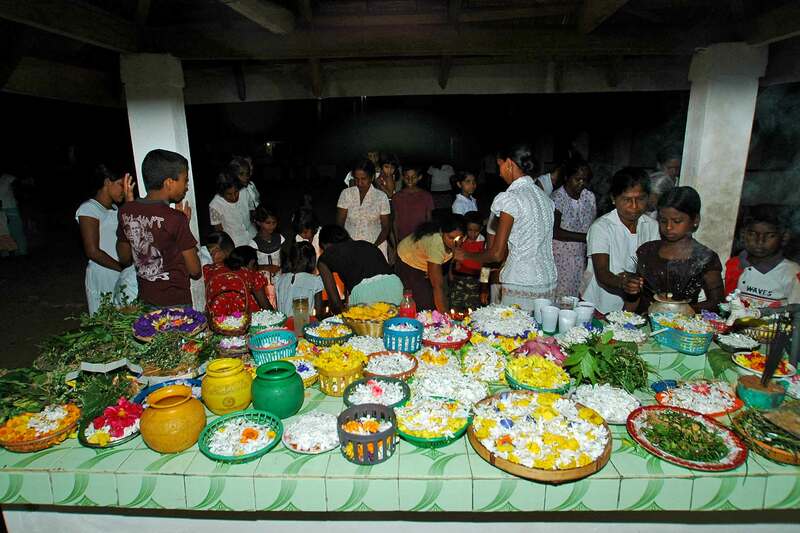 As the evening approaches everyone forms a large circle around the main shrine in order to pass offerings from the preparation table to a smaller shrine under the Bodhi tree. Tradition has it that the man, who was to become the Buddha, achieved full realization of the way things truly are, under a species of fig tree (ficus religious) by the bank of a river in India over 2500 years ago. This is known as the Bodhi tree and in this ritual, the tree is honored as well as the Buddha himself. 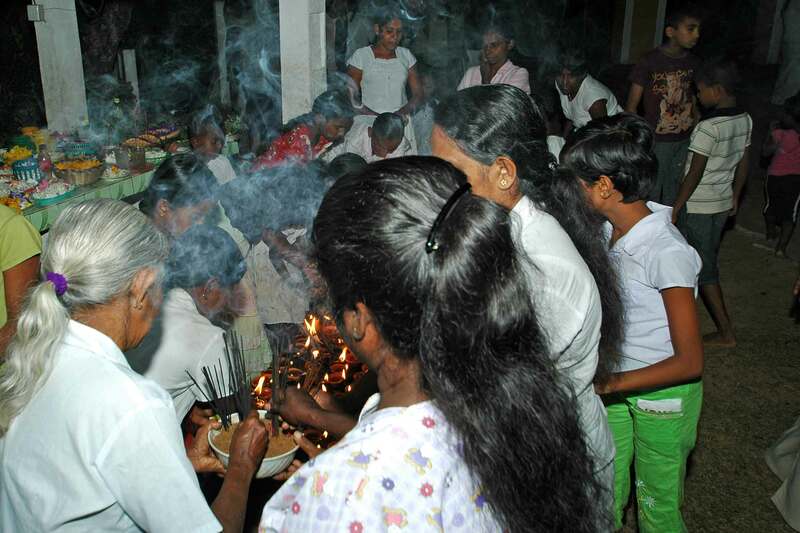 By passing coconut oil lamps, arrangements of flowers and lit incense from hand to hand, everyone participates in the merit of the offering whether they could afford to bring anything or not. As each offering makes its way down the line it is finally placed under the tree. 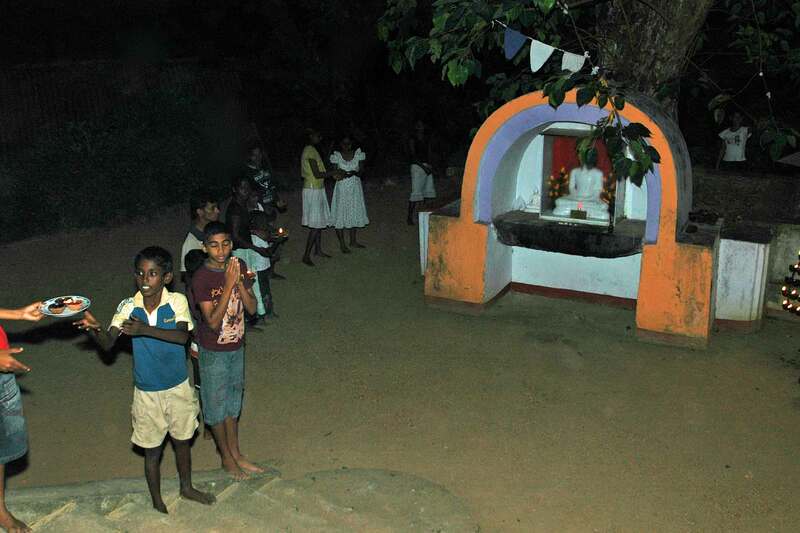 The flowers and incense are placed at the base of the Buddha image and the coconut oil lamps are placed on an upright metal grid and the glow illuminates the shrine and the carefully swept sand around the base of the tree. The light of the oil lamp is symbolic of the pure light of Wisdom or the Truth (seeing things as they really are) which one should find in one’s own heart, driving out the darkness of evil thoughts and our delusions about ourselves and others. The beauty of the flowers represents the beauty of a virtuous life. But they will soon fade and die, as will we, so they also remind us of the impermanence of life and that we should prepare for our rebirth or the after-life, depending on our beliefs. No matter how sweet the smell of the incense, it pales by comparison to the sweetness of a calm mind. As the smoke pervades everywhere, so the composure of the mind extends throughout our consciousness. The offerings represent gratitude to any teacher, not only the Buddha. That’s why I’m always given flowers, candles and sticks of incense when I first arrive and finally leave. It is also in consideration that one should not partake of good things without first having offered something. The word “offering” is actually a misnomer. The Pali (ancient Buddhist language) word for these things is Sakkara; that which should be done properly and means, honor and hospitality given to guests and so by extension, to a teacher or a symbol of one’s Teacher. Honor and respect shown through these material offerings and chanting are useful in stimulating practice but sincere honor and respect are only shown through the actual practice of these ideals. 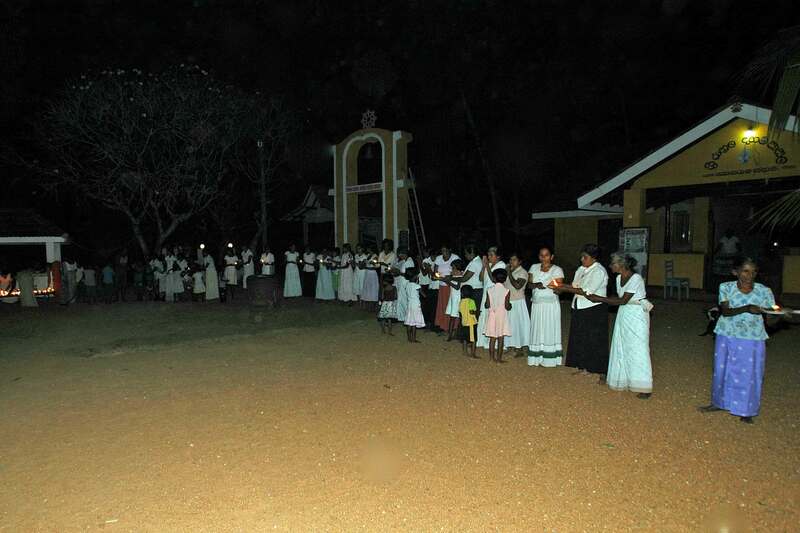 We’ll do the whole thing again on Monday the 9th as that’s the full moon or Poya day, a country wide religious holiday every month. It’s the day on which the most important services are held as a carryover from ancient times when most people didn’t have access to calendars and the full moon was the main way of marking time. If I were to guess why this service was held today I’d say it was to drag the men out from drinking parties on the occasion of Independence Day. I don’t think it was entirely successful. I know of at least 3 houses in the village where I could have joined in if I had wished. After a few glasses of arrack it doesn’t matter what language you speak, if you can still speak at all. I am mindful that I have always had fallen arches and no matter that I stand barefoot all day, they are not likely to get any worse. I am mindful to wash the bottoms of my feet before I get into bed at night. I am mindful that my bed at home is much more forgiving than the 2 inch cotton batting mat on a base of wooden boards that is my bed here. I am mindful that sleeping without covers in the jungle night leaves one’s body open to all sorts of predation. I am mindful not to forget to change the 12 hour pad in my mosquito repellant heater each night. I am mindful each time I open the tap that it might be the last water I get until the tank fills again from the higher water pressure that comes over night when there is lower demand on the small water main. 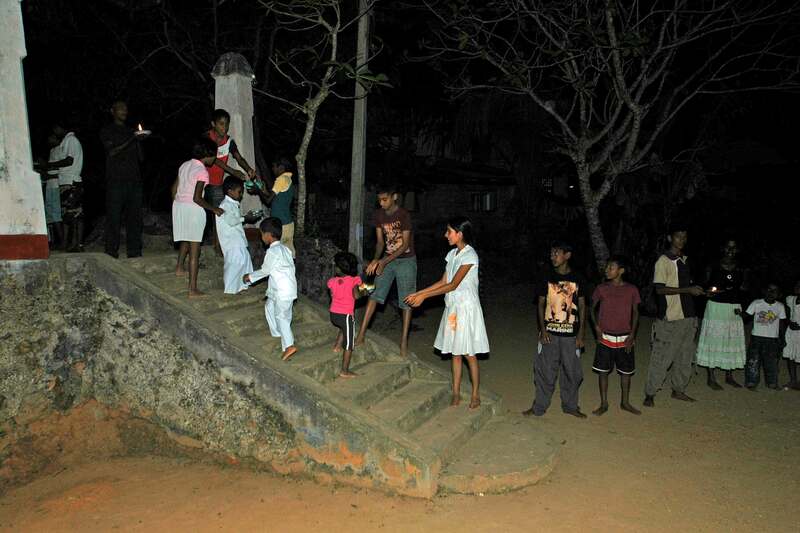 I am mindful that the inventors of the uninterruptable power supply were prescient about the capabilities of the Sri Lankan power grid and I thank them several times a day on behalf of computer users throughout the island. I am mindful that my honorable toilet flushes to a septic tank that is only a few feet from the building, is merely a 6 foot high, 4 foot diameter, concrete cylinder open on the bottom and buried to ground level. I have convinced myself that the water table is much deeper than that. I am mindful that curries are pleasantly stimulating when eaten but not so much so 12 hours later. I am mindful of the small children who call me “John Sir” and take my hands and each others as I walk across the compound trailing ribbons of children behind me in the sand. I am mindful of the villagers who share their meager food with me and the monks. 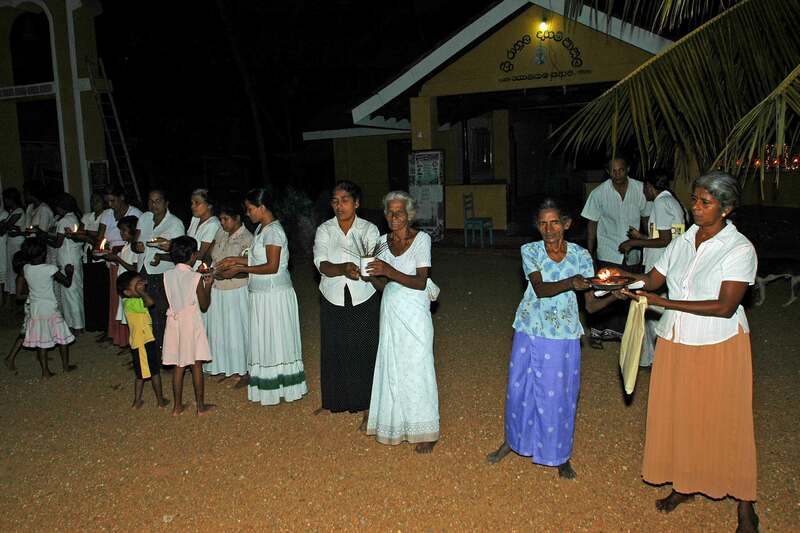 I am mindful that many of them are widows, widowers and orphans who had more than material possessions taken from them by the Tsunami. I am mindful of the grandmothers who always stop and greet me with smiles that light up the shade beneath their sun umbrellas. I am mindful of being separated from my family. My son John and his new wife, Lauren, my daughter Kate busy with her own work guiding a youth group on mission work in Cambodia and Vietnam, my daughter Lisa who is battling cancer and about whom I think every day. And my wife Sandra and her loving support in sharing me with the people here. I am mindful that moonlight through the jungle canopy is a better sleep aid than any pill. Ayh yo! I have carried on, haven’t I? I must have had much too much time on my hands today. 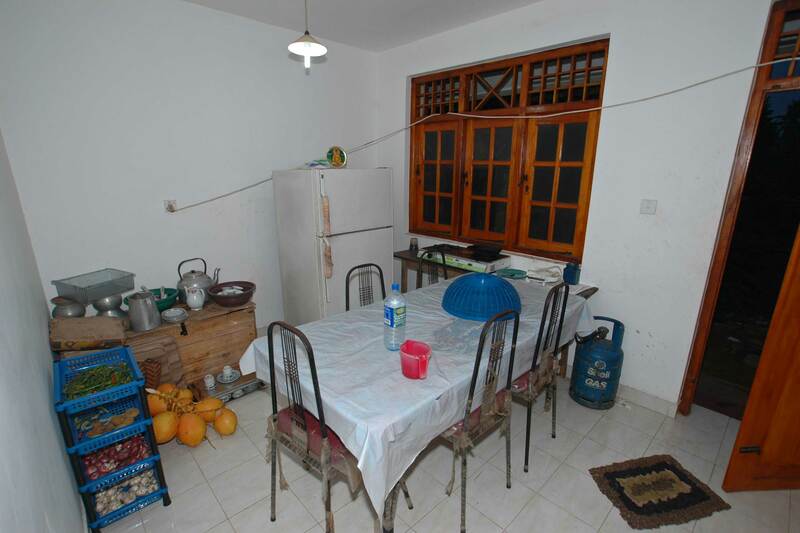 Since the dining hall is now the class room, the kitchen is also the eating area. The power cord is strung in and out of windows to provide enough power to run all the PC equipment. Hope to get an electrician here soon. 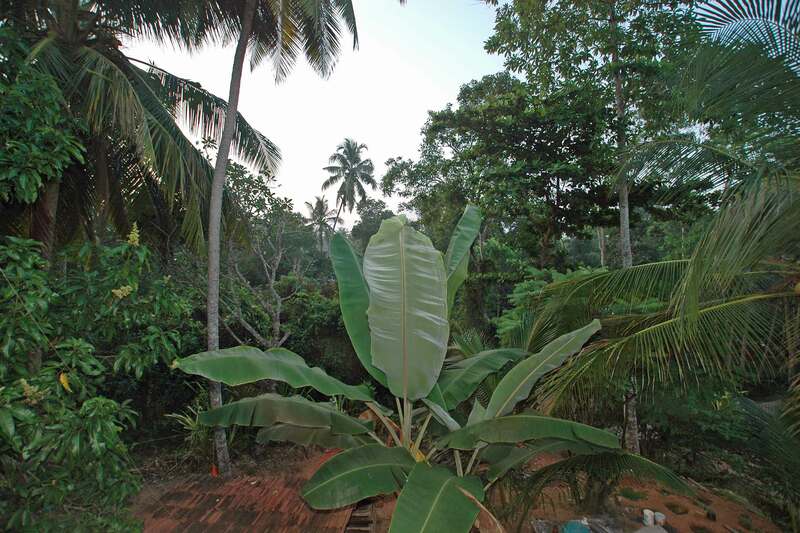 I can reach out my 2nd floor bedroom window and pick bananas for breakfast. Nanda cooking okra for dinner for me, himself and the other 2 novices. 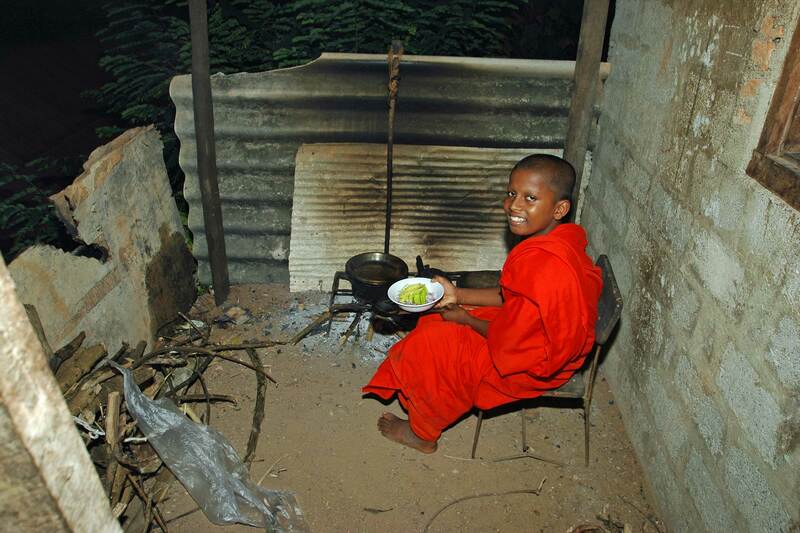 Ordained monks don’t eat an evening meal but an exception is made for young novices as their bodies are still developing. Today we start Windows XP. If anyone is interested in the lesson materials I am using, they can be found online at www.gcflearnfree.org . (16May2012- I have just checked this site and found it to be even more useful now with interactives and videos). Fortunately, I had the good sense to download them to my laptop before leaving Seattle. I have now loaded them onto the 6 PCs so that they can continue to be of use once I am gone. I hear the fish monger calling as he rides his bike through the village this morning. The sea is bountiful but fishing is largely a cottage industry. The kerosene lamps of the small boats can be seen at night strung out like a string of pearls on the horizon up and down the coast. When they return in the morning, most of the larger fish are sold to restaurants and dealers from the city. The villagers consume only small fish that they catch in co-op beach nets or can afford to buy. These are mostly dried in the sun and used as flavoring in other dishes. A luxury is a small fish of the mackerel family that is cut crosswise and prepared in a curry. Just finished teaching about half of XP to the teachers. Looks like I have to go to town again. The last power surge took out 2 light bulbs in the class room. So I will send this email then.